I'm always a collector of weird and old pieces of computer hardware. Some would even call me a hoarder (Amy especially). But there is a reason why I love collecting the old hardware. It's so that I can find an alternative purpose for it. In this case, the transplant candidate is a Cisco MC3810-V which has long been discontinued, The original purpose of this router was to help me get my CCNA. As always, life gets in the way so non-essential projects get put to the side. This is what I ended up with after a few hours on Saturday. 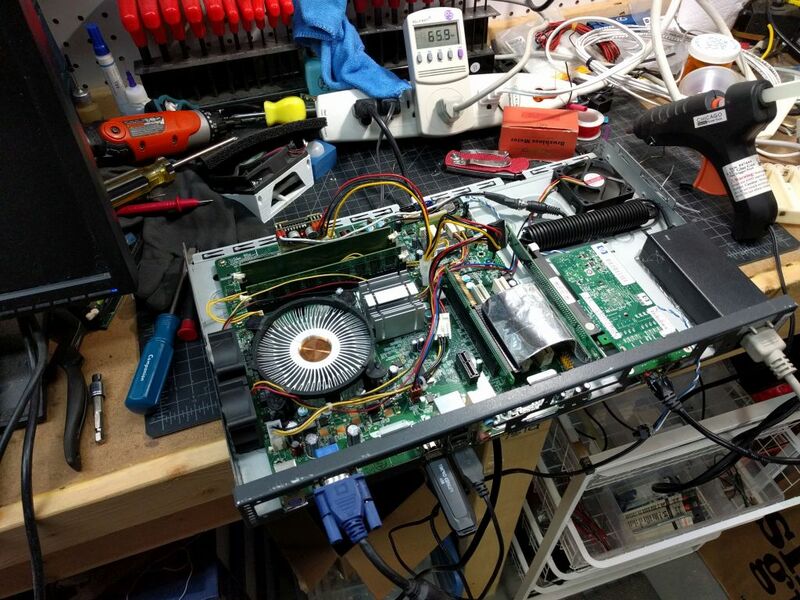 Surprising is the picoPSU actually worked on a Dell motherboard. 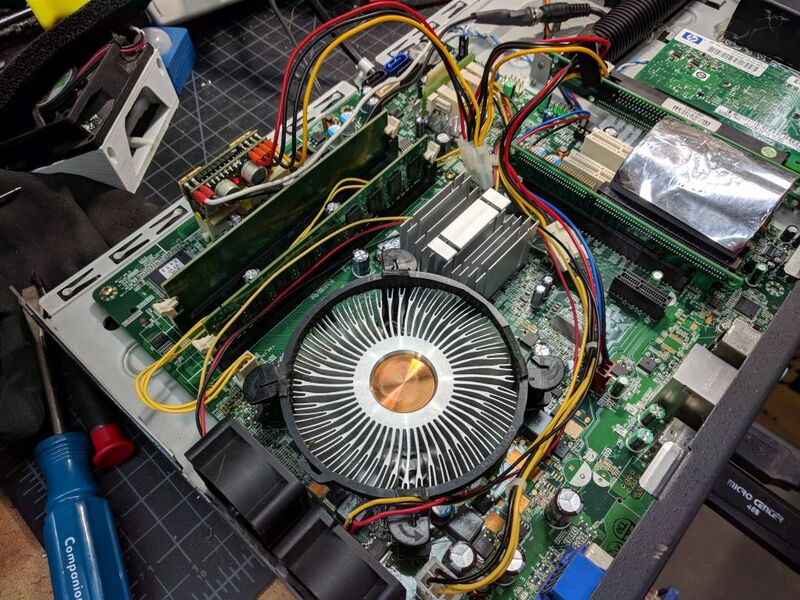 I was for sure thinking that Dell was using some propitiatory connection between the PSU and the motherboard, maybe this was an old thing. If you look closely, you can see that I'll pulling 65.9 Watts. I'm essentially doing an infinite loop to stress the system and see if my cooling solution works. A lot of Dremal tooling was required to get the motherboard in. Much less than other custom builds, but always the least fun part of any build. Some of the slots that were originally used by the MC3810 got reused nicely. Woot woot, less Dremal work. Some people will recognize this cooler, it is Intel's heat sink and fan combo that they've been using for retail CPUs for as long as I remember. I never use these for new builds and just toss them in my parts bin. Removing the fan helped make clearance in the 1U case. Kind of nice to know that you can make a 1U heat sink from these paper weights. Over all I'm pretty happy with this build. I'm still stressing it and working out some of the kinks before I do some more testing with the hood attached. It ended up running for 1 hour with a 30 minute load average of 2.2 without letting up. Idle is about 28-30W. Pretty good for a first test. One problem area that I'm seeing is the external power brick is getting extremely hot. Too hot to hold a finger on it for very long. One mistake I made was looking at the power meter and seeing that it was only pulling less than .55A and thinking it was okay since the power brick can handle 12V @ 5A. The .55A was at 120V which is 66W which exceeds the 60W that the power brick should support. Uh oh. No wonder it was cooking when running at 66W. Hmm, let's not do that again. I know the system won't ever be fully loaded like this, but I'd be happier if I had an extra 20% of headroom. More permanent fan bracket solution.